When the lights go out and the entire world is thrust into the technological nether, we’ll need board games like Turing Tumble. Created programmer Paul Boswell – he’s well known for programming complex games for Texas Instruments calculators – and maker Alyssa Boswell, the Turing Tumble lets you use small parts to create logic flows in order to solve puzzles. Boswell created the game to teach everyone how to program. It rose out of frustration. In his work at the University of Minnesota he found himself stuck with scientists who couldn’t manage programming or computational analysis. The game is simple. The set of marbles roll one at a time from the top of the board through a series of pins and “logic” pieces. When the marble hits a flipper at the bottom it releases another ball – creating a computing cycle. 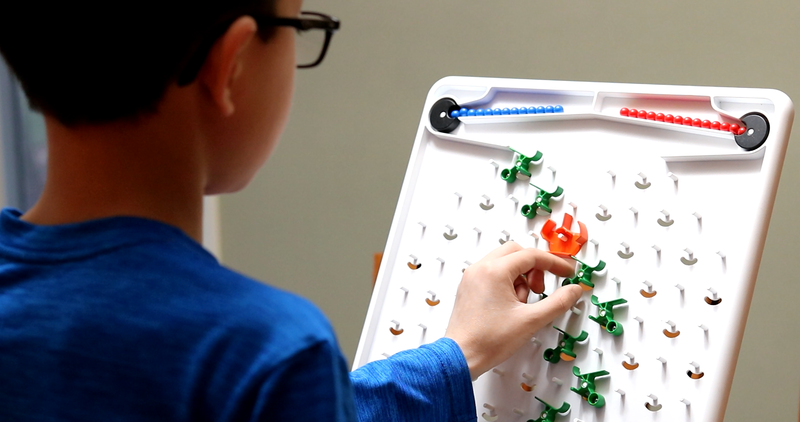 “Players add logic to the game board by placing six different types of parts onto the board. The ‘Bit’ is a particularly important one. Each time a ball runs over it, it flips to point the opposite direction. Pointing to the left is like a ‘0’, and pointing to the right is like a ‘1.’ Gear bits are the most interesting part, though. Gear bits are just like bits, except that they can be connected to one another so that when one is flipped, it flips the connected gear bits, too. It’s these parts that make the computer Turing-complete,” said Boswell. The important thing to remember is all of this is presented in the guise of a puzzle game. A book includes 51 games that teach kids how to make XOR gates and other computing principles. The project is entirely bootstrapped and the pair hopes to raise $48,000 to start building the game. It looks like a fascinating and educational game and maybe one day you’ll use it to manage the books at your primitive butchery when all the computers shut down. It could happen.